This week’s local by-elections were both tidying-up exercises following last month’s nationwide contests. Neither result has altered the balance of power on the councils in question. But in both cases the ruling party now has an overall majority of a single seat. 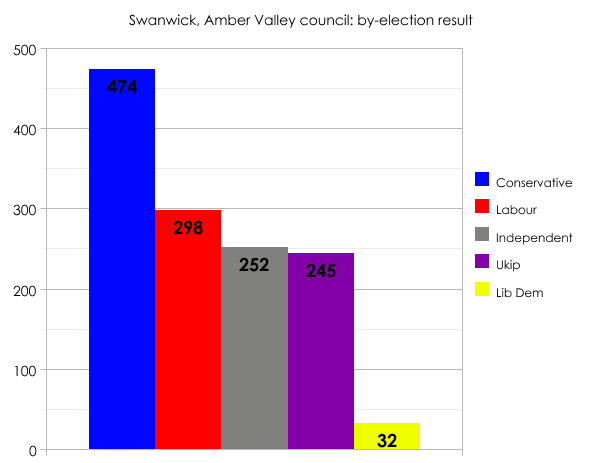 In Amber Valley, the Tories held on to a seat in the Swanwick ward. The contest had been postponed from May due to the death of a candidate. The Tories were expected to hold the seat, so the result isn’t really a surprise. More noteworthy is the swing from Tory to Labour of 2.4%, the fact Ukip came fourth, and the very poor showing by the Lib Dems. Labour controls Amber Valley council, but by the tiniest of margins: 23 seats to the Tories’ 22. Council meetings in Ripley will undoubtedly be lively affairs over the next few months. The same will be true in Hendon Town Hall in north London, headquarters of Barnet council. Yesterday’s by-elections in the Colindale ward, which again were postponed from last month because of the death of a candidate, saw Labour easily hold three safe seats. There was an overall swing from Conservative to Labour of a hefty 9.3%. Note the particularly bad performance by the Lib Dems, and Ukip coming a long way behind both Labour and the Tories: trends that were much in evidence across almost all of London last month. 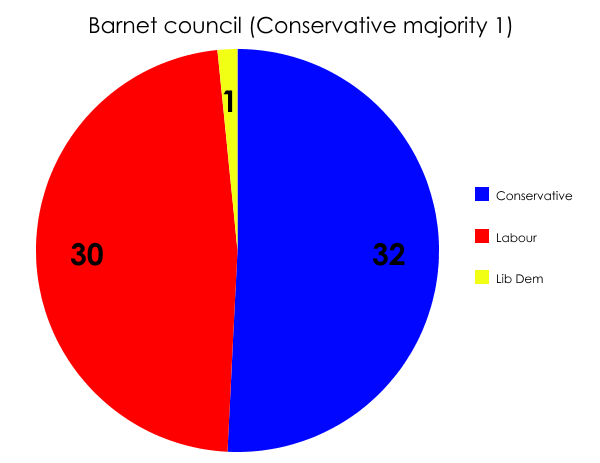 Barnet council has had a stormy history of late (and I speak from personal experience, being a resident of the borough) but the new distribution of seats means things could be about to become even more tempestuous. Conservative councillors will be under constant pressure to make sure they don’t miss any key votes. And of course, the same goes for their Labour counterparts on Amber Valley council. A single defection in either location, or a further by-election which sees the ruling party go down to a defeat, could lead to a brand new administration. We’ve more unfinished business next week, when the long, long saga of the local elections in Tower Hamlets should come finally to an end.